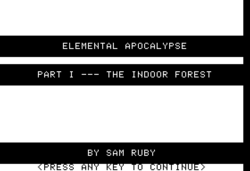 Elemental Apocalypse is a four-part Eamon adventure written by Sam Ruby, with each part occupying its own diskette. The parts are titled "The Indoor Forest", "The Search for the Hidden Valley", "Mount Mundabar", and "Assault on the Element Lords". This page was last edited on 24 February 2018, at 07:14.